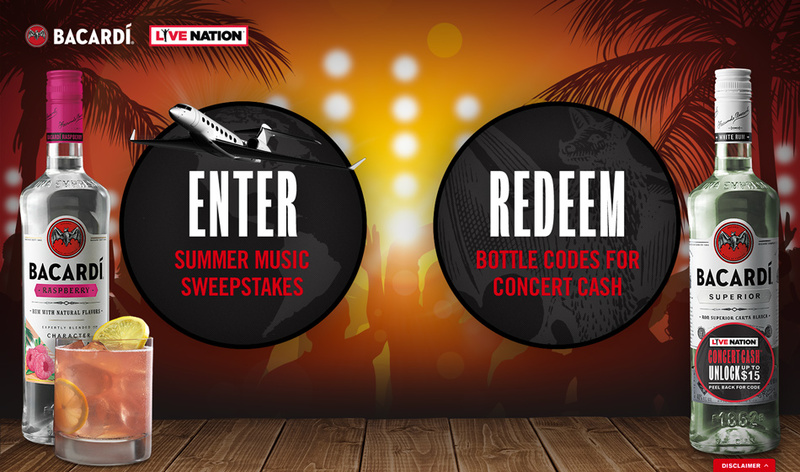 Avid fans enter to win the Ultimate Summer Music Experience. 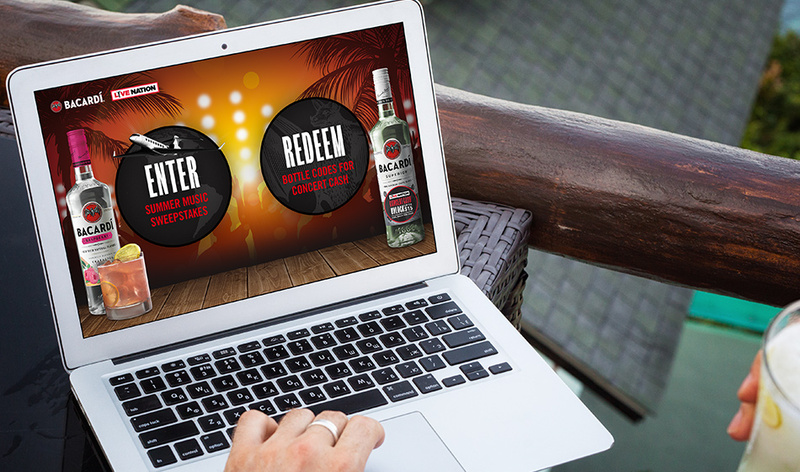 Develop a mobile-first microsite highlighting the Bacardi Summer Music Sweepstakes, and the “gift with purchase” promotion. Create a compelling digital experience by adding seamless animations and form integration. We set out to create something truly unique, by creating a full-screen interactive experience with an intuitive UI/UX and eye catching key art. Over a 5-month span, we monitored, tracked, and distributed thousands of online concert cash codes, while making certain that our servers were secure and reliable. Live Nation and Bacardi were thrilled with the final outcome! The immersive full-screen experience, seamless page transitions, and simple entry process made this a project that no one will soon forget. The website continues to handle a plethora of online traffic and distribute unique concert cash codes on a daily basis. 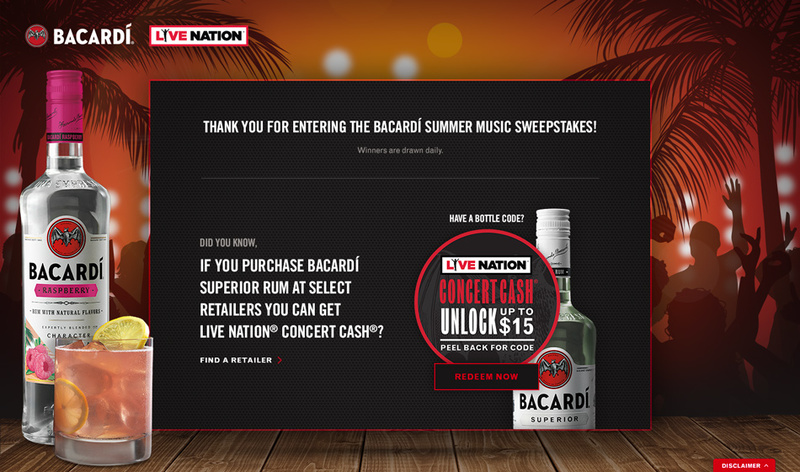 Bacardi selected Live Nation to help them promote their 5-month-long Summer Music Experience. Live Nation turned to Haven Agency to pull it all together. 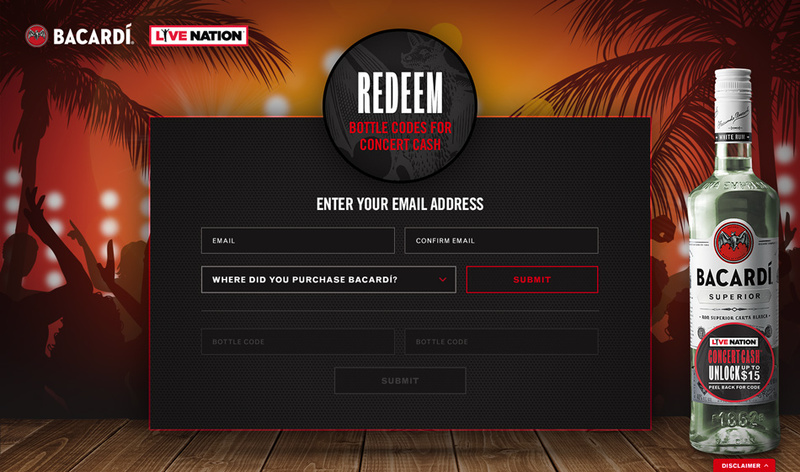 We designed and developed a microsite that included an age gate, sweepstakes with secure form validation, prizing details, and a concert cash bottle code redemption system. 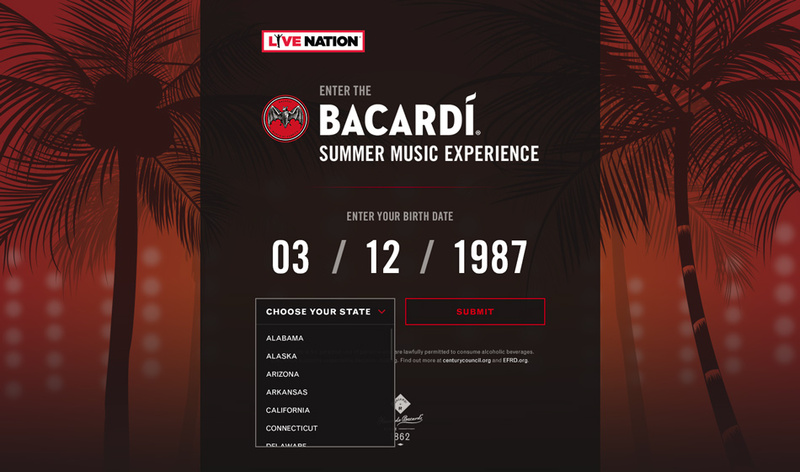 Users were given three unique entry points: through the microsite sweepstakes, via Bacardi bottles with concert cash codes, and on-premise at select locations serving Bacardi. 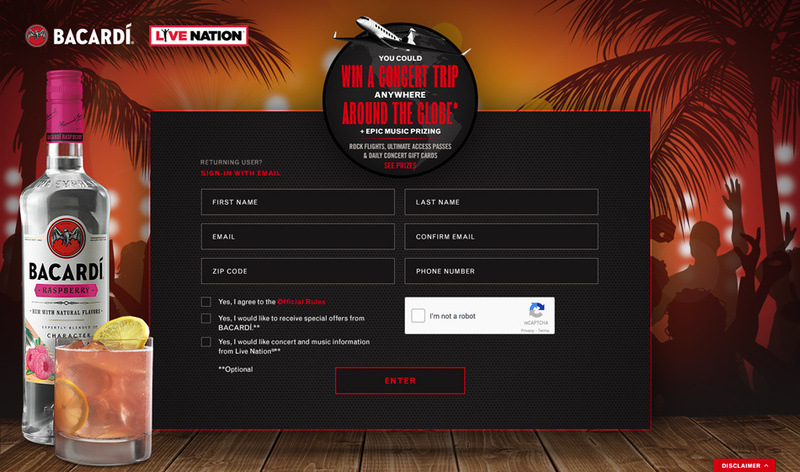 Users were allowed to enter the sweepstakes every day for a chance to win daily concert cash, up to $500 in value, and be entered to win the Grand Prize of a Global Rock Flight to Live Nation concerts anywhere around the world. Three first place prize winners won a U.S. Rock Flight, and five others won Ultimate Access Passes to select Live Nation concerts for the year. There were a lot of prizes at stake for this sweepstakes, which gave users even more incentive to return to the website and enter the sweepstakes multiple times. After the initial kickoff meeting with Live Nation, our team set off to the whiteboards to start brainstorming ideas about design and functionality. We concluded that a full-screen experience would deliver the most visual impact and lend itself well to the assets and content provided. Through a series of iterations and explorations, our design team churned out over a dozen website comps including mobile mockups, hover states, page overlays, and front-end build elements. Our front-end development team utilized their expertise in GreenSock to add some incredible animations and page transitions to the site. Not only was the site full-screen, it responded to every breakpoint and functioned superbly on mobile devices. We used a series of global variables, mix-ins, and page layouts to create a bulletproof build framework. Our talented team of back-end developers worked diligently behind the scenes to create an infrastructure to house all of the data received from the website. Tracking user submissions, Twitter bonus entries, page analytics, server stability, and automated emails was no easy task. Our team stepped up to the plate and hit this one out of the park. With staging and production servers in place, it was up to our development team to deploy on time with 100% accuracy. We utilized the Twitter API to serve up bonus entries, and an AWS server cluster to allow for auto scaling bandwidth. We created a series of custom scripts to validate and deliver emails along with concert cash codes on a fully automated and trackable delivery system. From concept to completion our team put in the extra time and effort to make this project one to remember. With every new challenge comes a new set of skills, and we were ecstatic to be given this opportunity to prove what we can do. 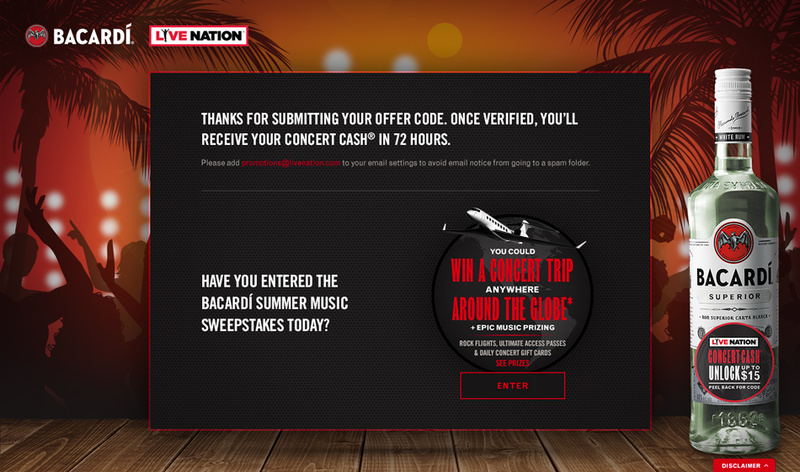 We continue to partner with Live Nation and Bacardi to promote and maintain the robust Bacardi microsite.